What Is The Importance Of Outline In Dissertation Writing? 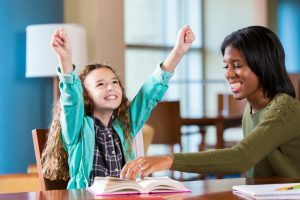 Elementary age Caucasian girl with curly brown hair is raising hands excitedly and celebrating after completing a homework assignment. A student is sitting at the desk in public library after school and working on homework assignments with the tutor. The tutor is an African American high school or college age female student. Before start working on a task, your mind is like a blank page that will be fulfilling with scattered ideas as you would start doing research so to prevent yourself from confusion enlist the number of activities that you are required to perform that task i.e. dissertation. So this is outline prior writing that is going to clarify your thoughts and enabling you to develop new ideas. If you are new researcher then you might do not know what are your lacking points or weaknesses in terms of research writing but outlining the activities before actually start working will help you to find your weak areas. So it will prevent you to face hurdles during the writing process by overcoming weak points in advance. A student who is going to write a dissertation for the first time is possible to get lost in numerous activities and find himself as doing nothing. So preparation of an outline is not only going to help you in writing of dissertation but also to set a stepwise sequence of activities that would keep your ideas consistent and focused on your main goal of the research process. For example, you might have an idea that would add a supporting argument of a particular author but at the time of writing you might forget and it might frustrate you but an outline will keep you on track as you have mentioned it in your outline. This is the most important aspect that is directly interlinked with all above benefits as you seek all of above benefit of outline making then for sure you are going to save your time and energy. An outline gives you a path without being distracted, stressed and frustrated you would put all of your energies to the end goal that will surely save your time. So a complete written outline gives you an opportunity to connect and expand ideas together that will increase the flow of process and movement of one step to another. So you will start your project as you planned and would end up doing your task as you worked according to the planned outline. So do not waste your time by doing a research on plenty of topics but to stay focused prepare an outline prior writing process of the dissertation. How To Ensure That Deadlines Are Being Set And Work Will Be Completed On Time?